Send it Clear takes card making to a whole new level. Clear cards! Each card sets comes with 3 clear pieces, binding stickers and a clear envelope. Please note that Clear Scraps cards are crystal clear once you remove the protective film from both sides of the card. You can paint, ink, stamp, sticker and even emboss these great clear cards. Super sticky 1.0" circle stickers. Great for binding and project together. Come 4 disc to a strip. Each package includes 5 strips for a total of 20 disc. Send it Clear Belgrave card comes with 3 clear pieces, binding stickers and 1 clear envelope. Card measures 4.25 inches x 6.0 inches. Each cards comes with a protective film that need to be removed before decorating. All Clear Scraps acrylics are crystal clear once film is removed. Clear Envelopes are USPS approved. Each envelope measures approx. 4.5"x6.5". Great for any card making project. 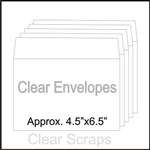 Comes in packs of 20 clear envelopes.